Today, I did the riskiest thing I’ve ever done as a teacher – bring two of my students with me to Ateneo de Manila University. I have too many things to say about how today went, so I’ll try to keep this short enough before it reaches that too-long-didn’t-read level. I will most likely fail in this attempt, however. Let me introduce to you two of my students – Kurt Christian (KC) and Mark Andrie (spelled Andrie, pronounced Andrei). In an attempt to at least make some impact on these two kids a la Sabrina Ongkiko’s on her student Darwin, I thought of bringing my students. I got more than I expected. KC is one of my favorite students (secret lang to!) but he’s a non-reader. He has a difficult time reading even the most basic of words, which is why it was to no surprise that in all his subjects, his grades were terrible. He only passed one class. Values class, with a grade of 80. Literacy was the first barrier that prohibited him from performing well in assessments. But he’s still one of my favorite students. Mayroon siyang aangas-angas na dating, at kung maglakad ay parang siga. Hindi naman siya gaanong katangkad, at 8 years old naman siya, ang nararapat lang para sa Grade 3. Today, I brought KC and his bestfriend Andrie to Ateneo. Inasmuch as I wanted it to be an experience for them, it turned out that it was much more of an experience for me. If our immersions in college would lead us to high-need communities, for KC and Andrie, going to Ateneo was like an immersion for them. Even in the car ride going to Ateneo, KC was getting motion sickness and was on the verge of vomiting. I told them to meet me in our school at 2pm. By 1:00, they were already there waiting. 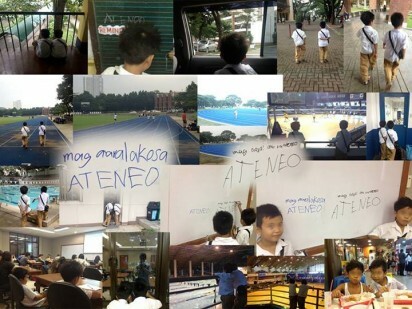 They were playing on the blackboard, and Andrie kept on scribbling the word “Ateneo” on the blackboard. Pagod na pagod na ako pagdating namin sa Ateneo, pero nawala itong lahat nang makita ko silang tumatakbo sa bagong oval ng Ateneo. Nang hindi sila magulo dahil sa kanilang pagpapanood sa Blue Eagle Gym. Nang sumilip sila sa chess room dahil naglalaro pala sila noon. Nang ayaw nilang umalis ng swimming pool dahil nanibago sila sa lalim at linis nito. Nang nag-tricycle kami kahit na gutom na gutom sila, dahil sa pag-asang makitang naglalaro si Kiefer (Ravena). Nawala ang lahat ng pagod ko nang kuminang ang mga mata ni KC noong inaabangan niya ang “bell” ng Ateneo at tumakbo palabas para hanapin ang ingay. They sat in my statistics class (level up from solving word problems! ), and before my students came, I gave them my markers so they could write on the whiteboard. Here I have a non-reader, who struggled blending each and every syllable of this phrase, just to write it on the board. Before eating in McDo and going home, I obviously had to process and synthesize this experience for them – I did have an objective: I CAN + I WANT. I may have been successful with the I WANT, so I had to do something about the I CAN. After going to Moro, we sat on the benches near the High School. I called KC to come and talk to me. I showed him his report card. At that moment, KC’s eyes started to water, he looked at the ground, covered his face, then started to cry. Paminsan-minsan, kailangan nating magbigay ng pagtitiwala sa mga taong hindi naniniwala sa kanilang sarili. Kahit kailangang manggugol ng isang buong araw – dahil sa simpleng paniniwala na ito, malayo ang kanilang mararating habang-buhay. Mag-aaral ka sa Ateneo. Promise. Delfin Stephen D. Villafuerte, 21, graduated valedictorian from Ateneo de Manila University in 2013 with a Bachelor of Science degree in Management Engineering and a Bachelor of Arts Degree in Economics (Honors Program). He is one of five Fellows teaching in General Roxas Elementary School. 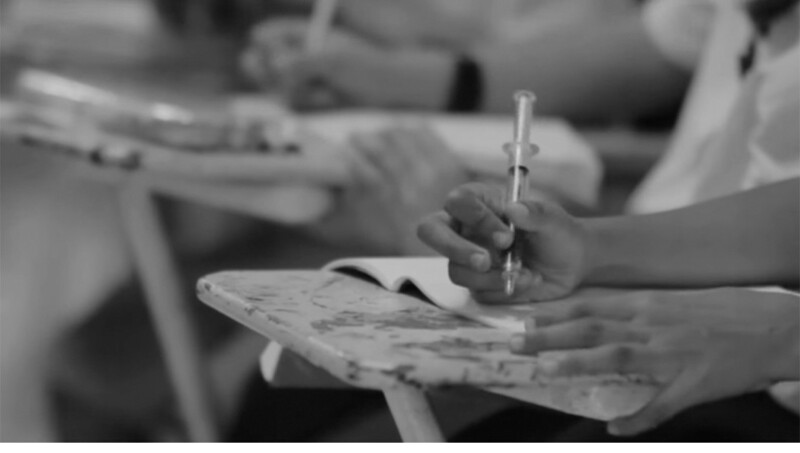 Why does education matter? Click here to see what some of our champions have to say.